US feminist, reformer, and writer Julia Ward Howe was born May 27, 1819 in New York City. She married Samuel Gridley Howe of Boston, a physician and social reformer. After the Civil War, she campaigned for women’s rights, anti-slavery, equality, and for world peace. She published several volumes of poetry, travel books, and a play. She became the first woman to be elected to the American Academy of Arts and Letters in 1908. She was an ardent antislavery activist who wrote the Battle Hymn of the Republic in 1862, sung to the tune of John Brown’s Body. She wrote a biography in 1883 of Margaret Fuller, who was a prominent literary figure and a member of Ralph Waldo Emerson’s Transcendentalists. She died in 1910. Julia Ward Howe, a day to promote peace and speak out against war. and poet Julia Ward Howe to promote peace and speak out against war. 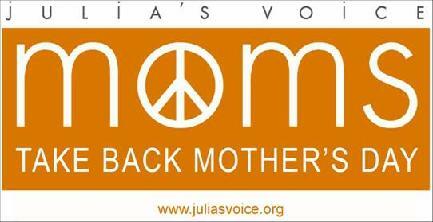 our first event to return Mothers Day to its original intent.